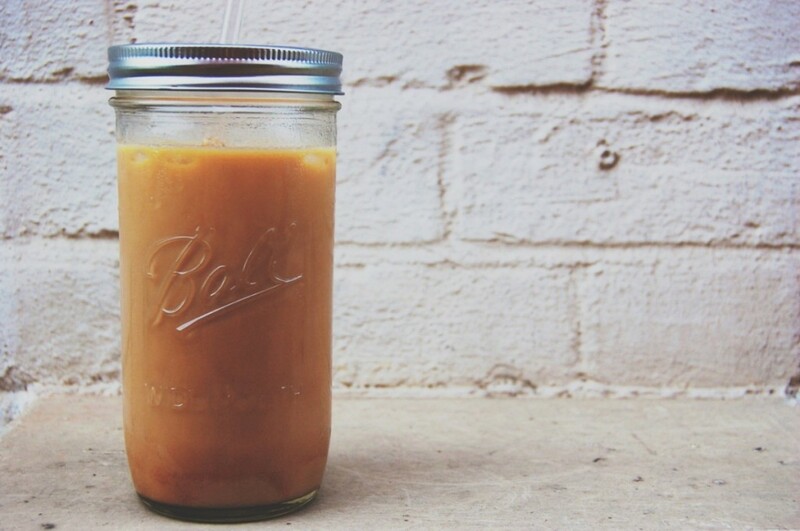 With summer just around the corner, its time to gear up for iced coffee season. This delicious cold beverage is a favorite among lots of people, including ours! Why not indulge a bit in style this time around? Did you know jars also make for unique drinking glasses and are one of many ways to repurpose our Mason candle jar? Those who are familiar with the delicate flavors of iced coffee will also know that this drink is undoubtedly enjoyed on many fronts aside from taste; including varied preparation techniques and presentation in which its served. Whether its showcased on ice or with a splash of cream, this drink offers plenty of eye candy for both the caffeine fiend and novice. You can swirl the contents around in the glass and watch as the cream and coffee fuse together, leaving behind a trail of wispy veins. Or simply add a few cubes of ice to your glass and watch the reflections glisten in the sun. In case you’re planning on impressing a group of friends or improving upon your home brew repertoire… any time is a good time for iced coffee. 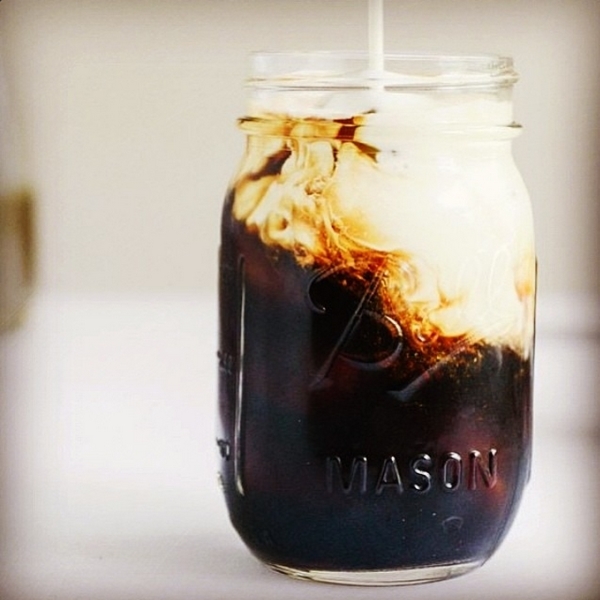 Here is a simple recipe to get those cold brews brewing! Before we get started on this vital elixir, you’ll need a few items beforehand… firstly, and mostly importantly you’ll need some coffee beans! Single origin or blended, this is entirely dependent upon your taste and preferences. Grab a few empty Mason jars and any coffee dripper such as a Melitta, Hario V60, Kalita Wave, etcetera along with their corresponding paper filters. For this particular brew style, you’ll want a coarse grind similar to what you would use with a French Press. (If you happen to have access to a commercial grinder, this grind is usually labeled as an 8.) Measure out roughly 4 tbsp. per every 16 oz. jar. Once your jars have been measured out, proceed by pouring just enough water to fully submerge the grounds (roughly 2-3 inches of water) and let sit for approximately 10 minutes. You can use a spoon to stir the contents to ensure all the grounds are fully soaked and/or submerged as you wait. In the coffee industry, this wait time is known as “blooming”–allowing the ground beans to expand and release natural gases and permeate flavor evenly. In most cases, the bloom takes anywhere between 30 seconds to 1 minute with hot water, but seeing as we’re making iced coffee this process requires some patience when using cold or tepid water. Once the bloom is completed, continue by filling the rest of the jar with water and let sit overnight in the fridge. One thing to keep in mind is the type of bean you’ve decided on. Generally speaking, the lighter the roast–the higher the caffeine content! The darker the roast, the more smokier the taste. Single origin coffees are usually lightly roasted (anywhere between Light and City), so the longer you keep your grounds soaking in the water, the more caffeinated or smokier the taste. Next, you’ll need your coffee filter setup and another jar to collect the filtered coffee. Slowly pour the contents from the chilled jar into the coffee dripper with an emptied jar underneath to collect the finished product. After the spent grounds have been filtered out, you can finally enjoy some coffee. This recipe is perfect for individual use and still allows room for some fun modifications. Experimenting with things like brew time, coffee blends, and infusions are also something to keep in mind. Some items I’ve used from previous batches have been cinnamon sticks, orange blossoms, ground Mexican chocolate, and whole vanilla beans. Coffee is certainly a fun canvas to work with! Aside from the few trusted favorites among bar-goers (i.e. Black and White Russians, and Irish Coffee) below are some suggestions from my own bartending collection that I found perfect for sprucing up a simple cuppa. -Add some heavy cream and 1/2 tbs. of Galliano Ristretto and a sprig of mint to introduce texture and herbal tones to your coffee. -Using equal parts water and raw sugar, put on a saucepan under low heat and stir continuously. Once the solution has taken on a syrup-like consistency, add 2 tbs. to the coffee along with 1 & 1/2 oz. bourbon (or rye whiskey) and 1 oz. of anisette including, but not limited to Herbsaint and Absinthe. Sambuca also fits this criteria, though it remains a bit on the sweeter side. Garnishing with some chopped ice helps to ease the alcohol taste and open up a lot of complimenting flavors. This entry was posted in Mason Jar Candles and tagged ice coffee recipe, mason jar recipe, summer iced coffee. Bookmark the permalink.